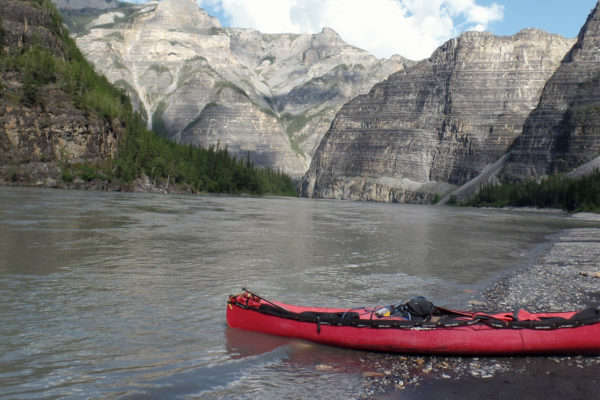 A Mountain River canoe descent is whitewater paradise among stunning mountain peaks – the perfect way to enjoy a challenging northern mountain river if you don’t have advanced whitewater skills. 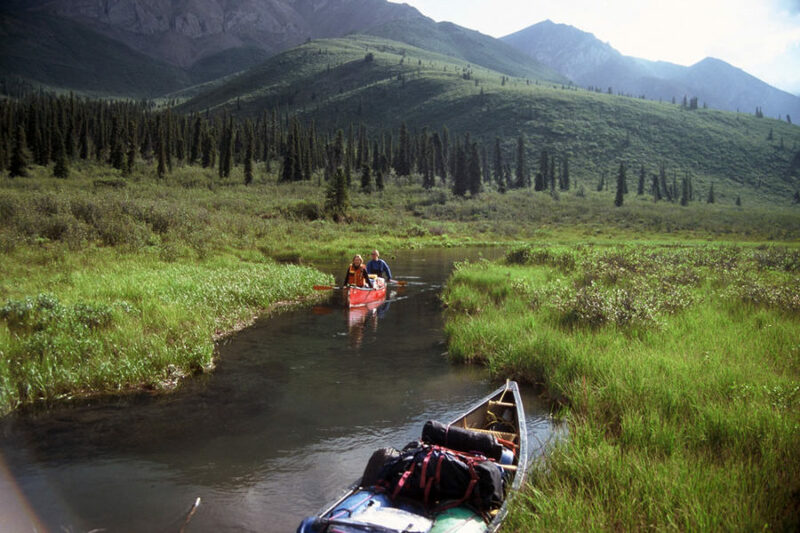 Another jewel of the Mackenzie Mountains, the Mountain River in Canada’s Northwest Territories is highlighted in Bill Mason’s book Song of the Paddle. Five spectacular canyons in a beautiful mountain backdrop offer a superb whitewater experience. 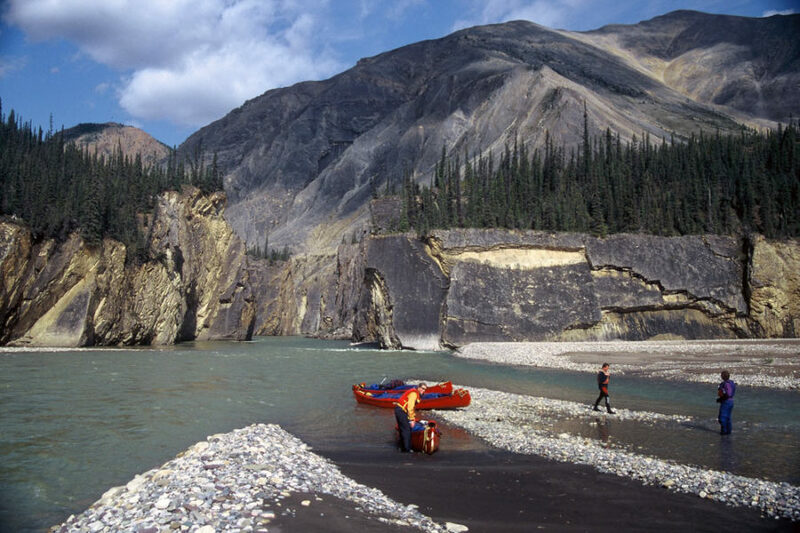 One of Canada’s most spectacular wilderness rivers, the Mountain River is traveled by fewer than 150 canoeists each year. 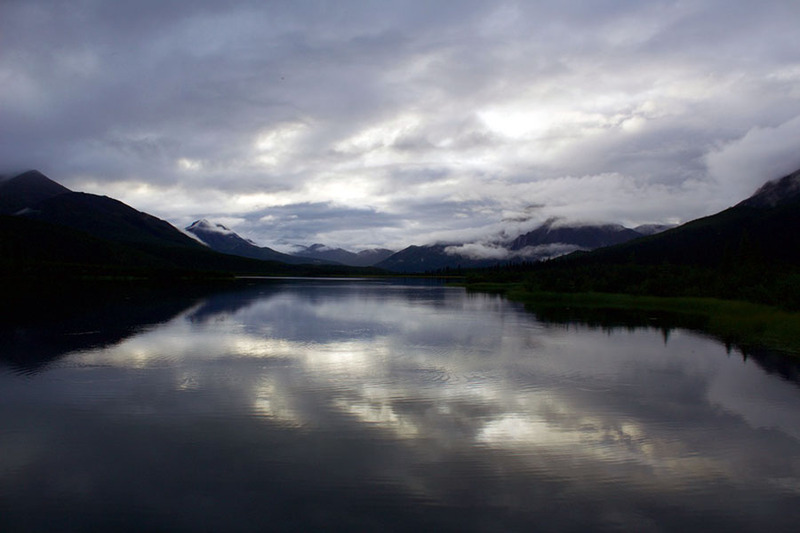 Wild and remote, the Mackenzie Mountain scenery is breathtaking. 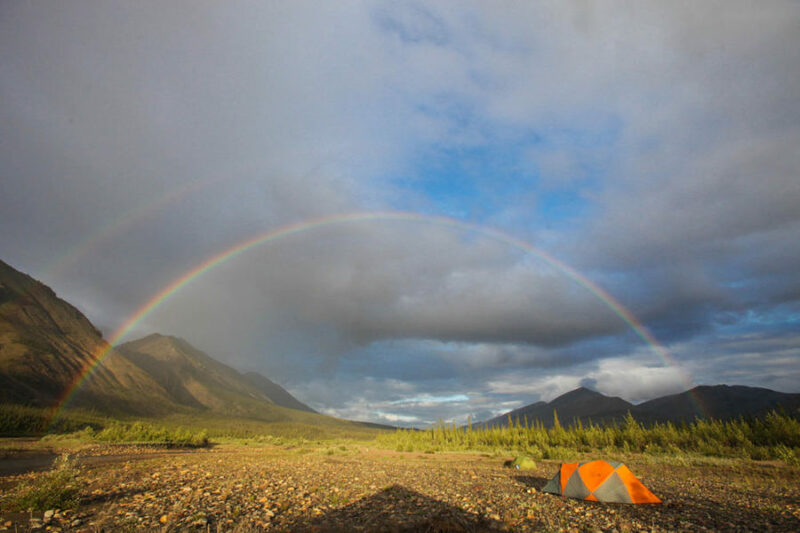 If offers glimpses of caribou, Dall sheep, Arctic wolf and moose, against a stunning backdrop of mountains that change in colour from buff, grey, cinnamon, green and maroon. The river itself drops more than 3000 feet, providing a roller coaster ride of almost continuous fun waves. 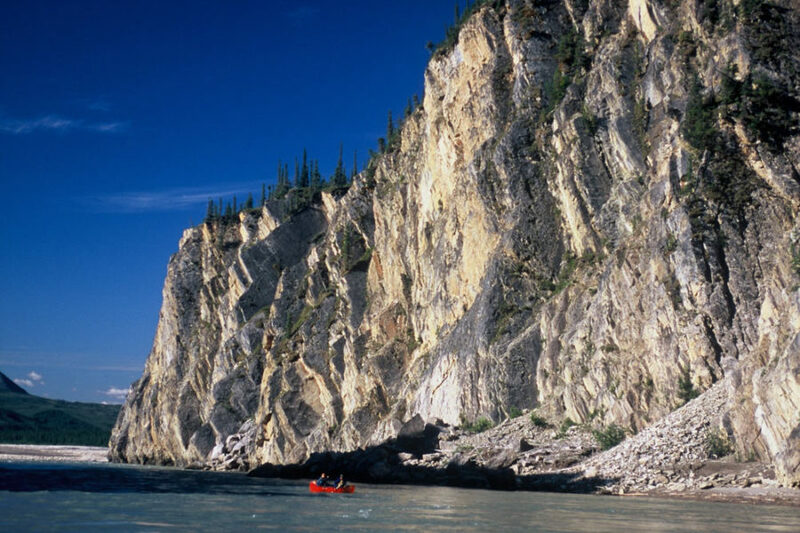 From the first paddle stroke to the finale at the Mackenzie River, the current never stops as we travel through five dramatic canyons. 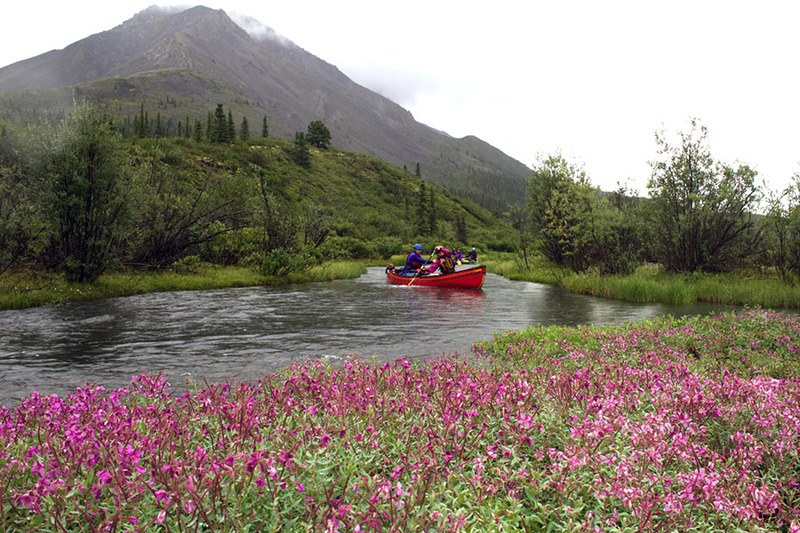 We canoe the Mountain River in two-person canoes from Willow-Handle Lake to the Mackenzie River traveling over 288 kilometres (190 miles). Wet or dry suits and helmets are mandatory for this trip. Please note that no stores are open between the meeting time and our morning departure. Plan to err on the side of extra warm clothing. If you wish, the guides can help you decide if anything should be left behind. Pre and post-trip accommodation is your responsibility – the cost is not included in the trip fee. 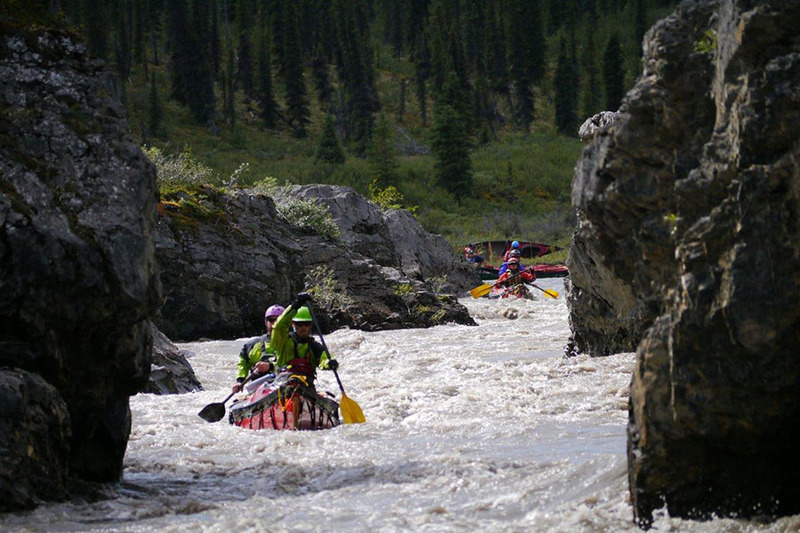 Skill Prerequisites: Intermediate whitewater experience is necessary – this is a fast and technical river. If unsure of your ability, please call with any questions: 1-800-297-6927 or (867)-668-3180. This is the first day listed for your trip. Your journey north from your home will be a refreshing departure. You will fly over the largest expanse of wilderness in the world with stunning views on cloudless days, pass through quieter and friendlier airports, meet friendlier and less harried service personnel and generally begin to immerse yourself in the wilderness experience that is about to unfold. Please plan to arrive in Norman Wells on the mid-day flight or earlier. Norman Wells is a small community on the Mackenzie River. 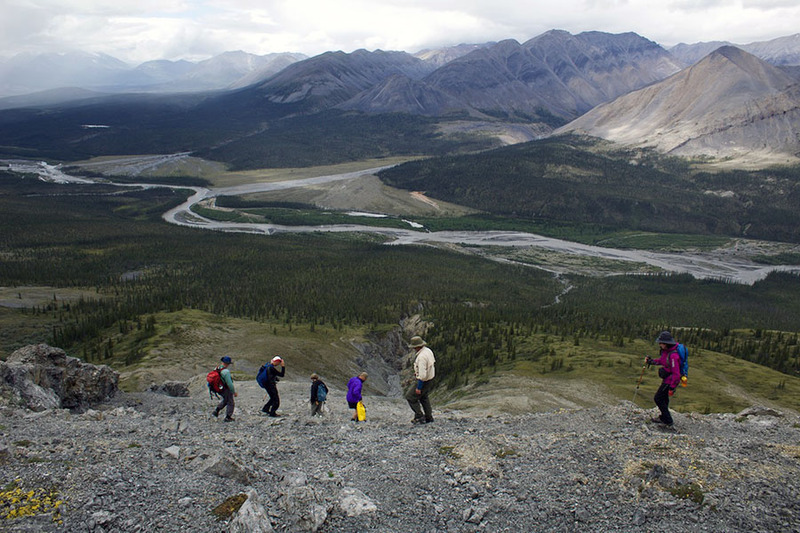 It is accessible by air from Yellowknife. This picturesque town is nestled between the Franklin and Mackenzie Mountains and dates back to 1919 when Imperial Oil set up a small refinery. 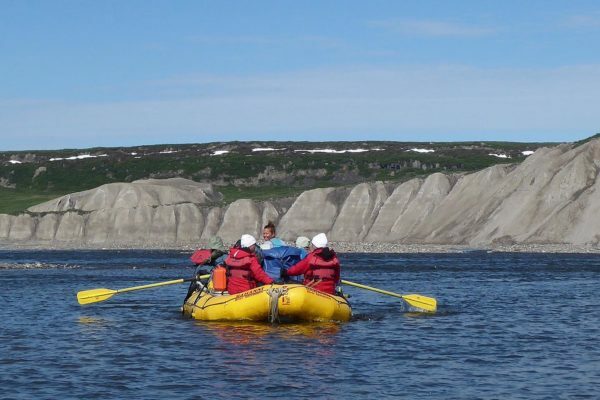 One of your guides will meet you at the airport and transfer you to the float plane base for final preparation before the trip. There will be a place to leave clothing not required for the trip. There will be a chance for last minute questions concerning clothing, gear, packing and other details. Weather permitting we will only be in town briefly so please do not count on major purchases prior to the trip. After loading the Twin Otter aircraft you will be flying westward over the dramatic Mackenzie Mountains. You want to be sure to have your camera on your lap! This is one of the first of many great highlights of the trip. Camp will be on Willow-Handle Lake. An alpine gem, frequented by mountain caribou. 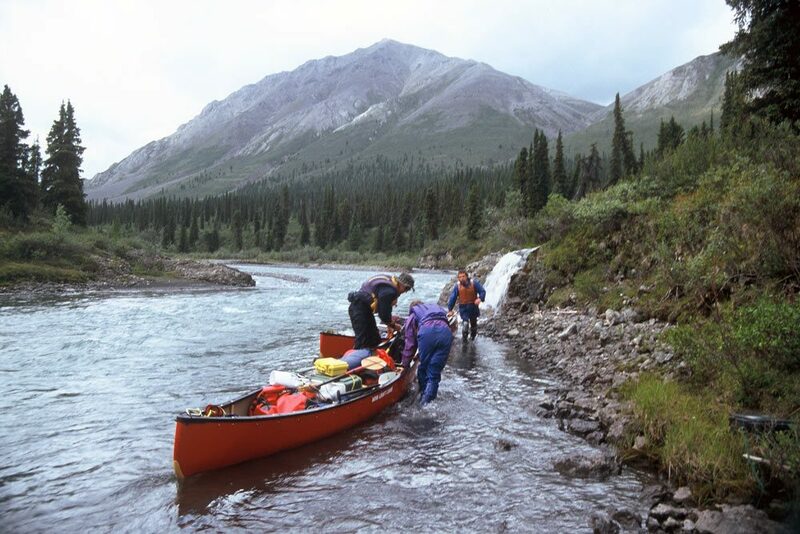 The adventure begins with the portage to Push-Me-Pull-You Creek. Floating the loaded canoes in this narrow stream we will wade in the shallows, pulling the loaded canoes until the creek broadens enough to paddle. Camp will be near the junction of PMPYC and Black Feather Creek. BF Creek is a lively run with significant gradient. Class III whitewater skills are put to use immediately avoiding rocks and on the many sharp bends in the beautiful low canyons. Exciting whitewater that demands respect. Camp will be near the confluence of BF Creek and the Mountain River. The channel triples in size at the junction with the Mountain. Navigational skills are required constantly to negotiate the braided channels. The gradient increases through the day with exciting hay stacks to challenge your whitewater skills. This day as on others there are chances to fish for trout and grayling in the clear mountain water. Keep your eyes peeled as locations such as “Grizzly Meadows” will live up to their name. The spectacular mountain backdrop has dominated the scenic panorama. Now it is time to get up close and personal with the geology. Visiting “The Moonscape”, mineral springs and “Fountain of Youth”, reveals the dramatic and beautiful creations of geothermal springs. These spots are often frequented by Dall sheep. Stopping at Cache Creek we can enjoy a mineral spring shower! This may be the location selected for a layover day. Second Canyon competes with First for excitement. Challenging corners, holes and rebounding waves dominate all of the Mountain River canyons. At the confluence with Stone Knife River the volume doubles and the action continues. By now you will have realized that there is not a dull moment on this river and you must “have your wits about you” every minute. Negotiating the rapids of Third Canyon challenges the whitewater skills. The river continues to wind through the mountain valley, dropping at a steep gradient. Moose, Dall sheep and grizzly inhabit the shores. After fourth Canyon the valley begins to broaden but the current persists. The ridges take on a new shape, providing diversity for the eye. 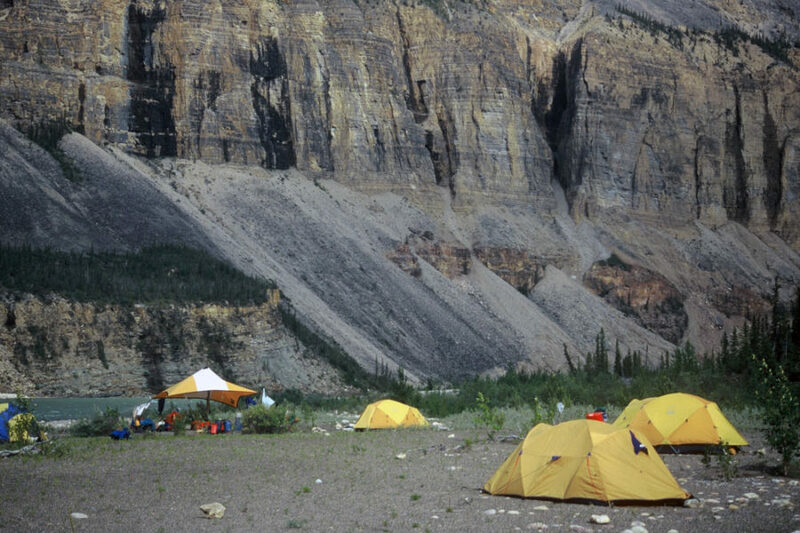 Camp is in the vicinity of 5th Canyon. We will be picked up by a float plane for the flight back to Norman Wells. Late in the afternoon you can settle into your hotel room (not included) for that long awaited shower and prepare for the evening. The group may want to gather at a local eating establishment (not included) to recount tales of whitewater and canyons. After goodbyes and a last look around Norman Wells, we will head for home with a cargo of fond and spectacular memories. Please Note: The above is a tentative agenda and has been designed with much thought to capitalize on the most scenic and exciting parts of the river while making time on other sections. 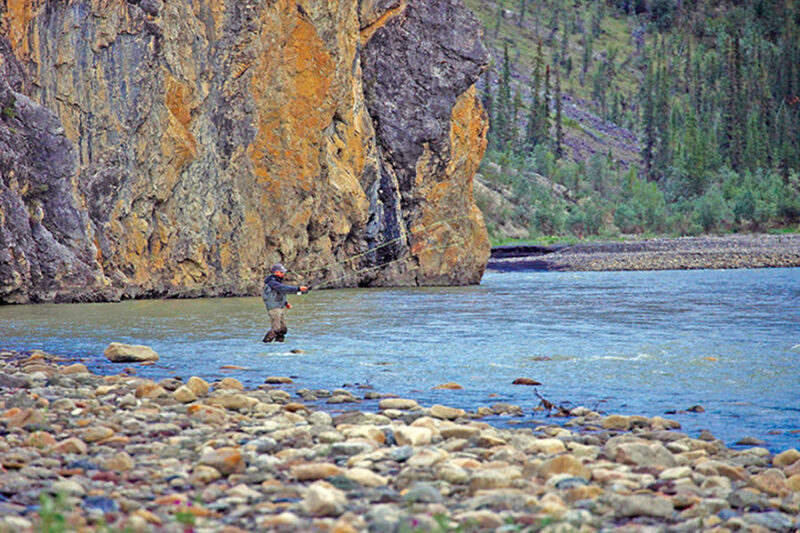 Your guides will adjust the schedule to make the best use of river and weather conditions. Wet suits or dry suits and helmets are mandatory for this trip. Plan to err on the side of extra warm clothing. If you wish, the guides can help decide if anything should be left behind. Breakfast, lunch, dinner and snacks are included from the pre-trip meeting until the final river meal. Any other meals off the river are your responsibility. Hotel costs and meals while in Norman Wells are not included in the trip fee. 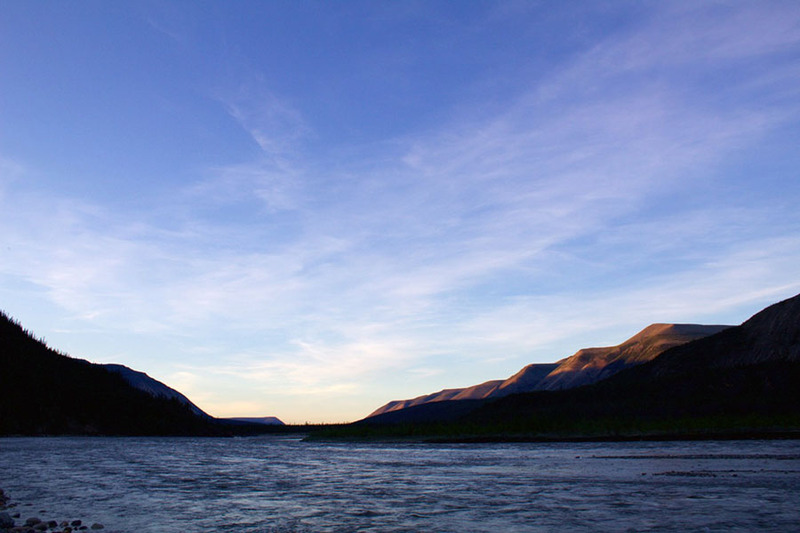 The Mountain River is one of the most beautiful rivers I have experience in Canada, sometimes fast and furious and sometimes slow and calming but always entrancing. I feel privileged to have seen some of its beauty.